management and coordination issue than one of affordability. used as permanent elements of the network security infrastructure. IDScenter is basically a front-end for Snort on Windows platforms (Recommended: Windows NT4/2000/XP). setting up Snort IDS and networks in general. IDScenter will help you doing this and also provides mangement features. o Sort rules based on source IP, port, etc. 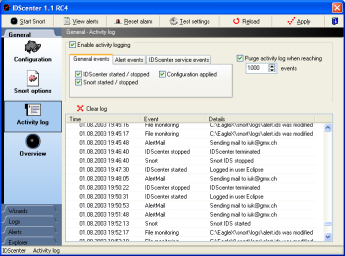 o Log events such AlertMail sending, Log rotation, Online updates, etc. deploy the IDS before your firewall. This will certainly require more performance of the computer and also log packets that will never pass the firewall. An IDS must be able to receive all packets of the network (promiscious mode). This works very good in a network that has a hub. If you have a switched network, you should connect the IDS host at the diagnostic port of the switch to receive all traffic. If you choose to disable IP/use a read-only ethernet cable you should perhaps install a second NIC and restrict the access to it with a firewall. Download a Snort package from SiliconDefense.com, CodeCraftConsultants or Snort.org (SourceFire). You can choose between an installer or a ZIP package. 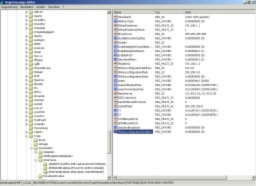 Recommended is the ZIP Package, because the installers can cause problems sometimes. Here only the installation of the ZIP package will be explained. Note: Disable IP or make an read-only Ethernet cable is not necessary but possible. Snort only needs to sniff packets to detect attacks and this is still possible. 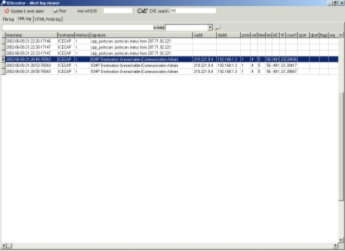 Download IDScenter from Engage Security site. Start the installer and follow the instructions. If the setup is finished, start IDScenter. Note: No network connections can be established anymore after using one of these methodes. You should have downloaded all needed tools before, have access to external mediums (Iomega ZIP, etc.) or a second NIC with access to another network (this network should be secured very restrictivly). of the registry :o) (Credits: Michael Steele, SiliconDefense.com). I modified some points of the instruction while testing it. to establish connections to/from this host. into the proper registry setting. It will have an actual IP address in one of the settings. From the "Edit" menu select "New" -> "DWORD value"
Click on the first value select it and type "30".. etc. Make sure you deleted the rest of the caratecters that were stading there before. It should look like in (B) now. you should see all kinds of traffic on that interface. but you can sniff all traffic and your IDS is a "stealth" host. After starting IDScenter you will see a small round black icon in the system tray. Double-click on it will open the configuration interface (1). DONT use the same folder as Snort binary is located! This is a very powerfull feature which allows you to generate reports using the Database logs logged using output_database Snort plugin. If you don't know SQL you can use the basic queries provided by IDScenter. Simply choose a Query in the combobox and click on "Insert"! 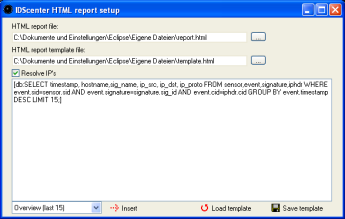 XML log file: use IDScenter XMLServer to log XML data from Snort XML plugin to a file. Set here the filename which is used by the server. You can configure Snort configuration file manually and/or using the wizards. Note: Unknown preprocessors supported if you configure them manually. Unknown output plugins are supported and will not be lost by saving the configuration (by clicking on "Apply"). Note: IP's are set like using CIDR format for subnet network masks. Multiple addresses: click on "Multiple hosts or networks" to add multiple networks/hosts. Use commas to seperate the IP's! 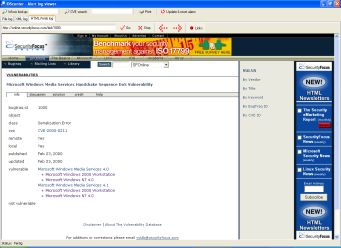 The other variables set the IP's of the HTTP and SQL servers, etc.. Here you can select and configurre the preprocessors used by Snort. For detailed information please read the Snort manual pages (snort\doc\SnortUsersManual.pdf). 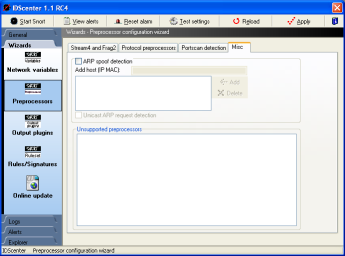 Frag2: IP defragmentation plugin. It is recommaneded to enable this to defeat fragmentation attacks (for example using fragrouter). There are several techniques known to bypass IDS attack detection using fragmented IP packets! Here you can setup all output plugins and also ruletypes! For detailed information read the Snort manual page please! There are many small wizards in this panel which will help you to configure the output plugins of Snort. 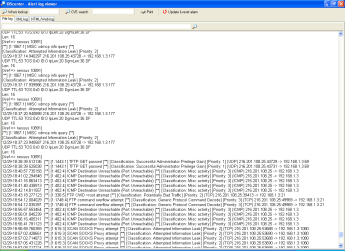 The screenshot shows a configured syslog output plugin. To create ruletypes type a name, choose the mode and click on "Create type".. this will allow you to have different logging possibilities, but the rules must also be changed for this. Note: Not needed, Snort will log using default output plugins. If you create log types, you have to modify IDS rules also! If you want add add plugin to a ruletype (see Snort manual for more informations), click first on the ruletype and then on "Add"
Note: Updating rulesets is IMPORTANT. It's like updating your antivirus signature file. The ruleset editor lists all available rules in the file. Select a rule and click on "Add/edit rule"
The rule editor allows to modify Snort rules (supporting Snort 2.x syntax). Log rotation will rotate the alert logs by compressing the files into a ZIP packages and move it to the Backup folder. If the IDS host should be down at this time, it will rotate the files at the next time the host is booted. The rotation progress can be displayed by clicking on "Show rotation progress"
Note: If the database is down, a message will be display in "Overview" panel. 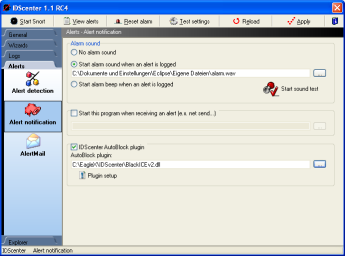 Select a WAV file if you selected "Start alarm sound when an alert is logged"
You can test if the alarm sound works with "Start sound test"
This could be used to start a script that reconfigures your router, generate HTML pages of alert log using an external program, etc. All Snort 2.x log formats are supported. Unofficial preprocessors are also supported! AutoBlock generates a list of IP's, TCP/UDP ports and ICMP information and passes it to a plugin. 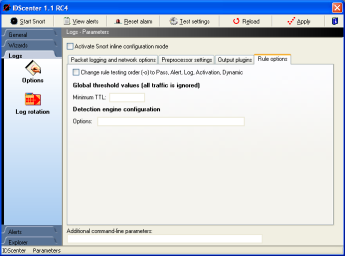 Open the setup of the plugin, by clicking on "Plugin setup"
Included are 2 plugins for ISS NetworkICE BlackICE firewall. The first does only block IP's. The second can block TCP ports and UDP ports and has also ICMP blocking support (but not all NetworkICE BlackICE versions do support the ICMP rules). You can select predefined queries and add them by clicking on "Insert"
Alert notification: Database option must be configured correctly! Click on "Apply" before using "Test AlertMail"
Note: If you want to cancel the current mail being sent, click on "Cancel mail sending"
In alert logfile viewer you can see the latest logged attacks. 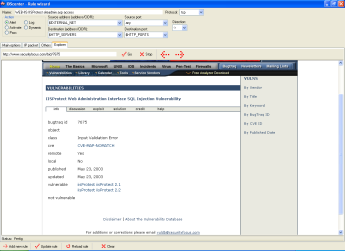 If you select an IP address, the logviewer sets this address in the WHOIS editbox. With ARIS you can gain information about an IP. 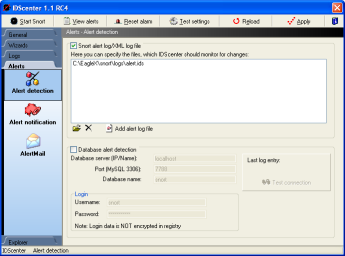 The logviewer can display Web sites etc. using Internet Explorer. Type bugtraq, 1000 or cve, ... etc. The explorer is usefull if you want to use ACID, SnortSnarf, Snort2HTML etc. If you looked up information about something, you can print the pages also. The software below is supplied free. You may use the software on your system for as long as you like. You may also give copies to your colleagues, friends and family. This software is also free for companies. You are specifically prohibited from charging, or requesting donations, for any such copies, however made and from distributing the software and/or documentation with commercial products without prior written permission from Ueli Kistler. You may distribute the software with other free applications providing that credit is given to the author where due and no profits are made directly from the software. The software is copyrighted and may not be modified under any circumstances or included with another commercial product without written permission from the author. You may not decompile, disassemble or otherwise reverse engineer the software. Your use of the software is at your own risk. The author shall not be held liable for consequential, special, indirect or other similar damages or claims, including loss of profits or any other commercial damages. The author specifically disclaims all other warranties, expressed or implied, including but not limited to implied warranties of merchantibility and fitness to a particular purpose. Your use of the software constitutes your acknowledgement and acceptance of these conditions.